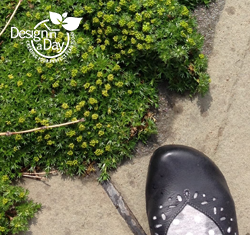 Maybe it’s not fair that most people don’t know the finer points of selecting stepable path plants. The truth is planting between pavers successfully without insider knowledge rarely ever results in what I would call low maintenance. It’s a little like Goldilocks and The Three Bears, the plant has to be just right. Remember? The chair and the bed had to be the right size and the porridge had to be the right temperature. If the plant you select is not right for the job, your path or patio can have problems that will take a complete do over to solve. Most people don’t want to trial and error plants. They want to know it will work before they put in their time and effort. 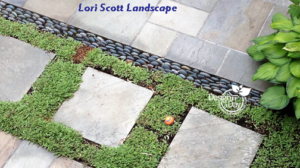 That is the advantage of hiring a Portland landscape designer. We know what works here and what doesn’t. Step on these plants. This keeps them growing low and dense. 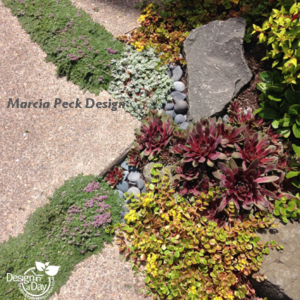 Here’s how I think about selecting stepable path plants. I want a plant that doesn’t grow higher than 1″ or 2″ tall maximum. Many stepable plants tend to grow into a hump and must be walked on regularly to keep it from growing into a hump and being a trip hazard. Stepping on the plants frequently will cause them to grow dense and shorter. 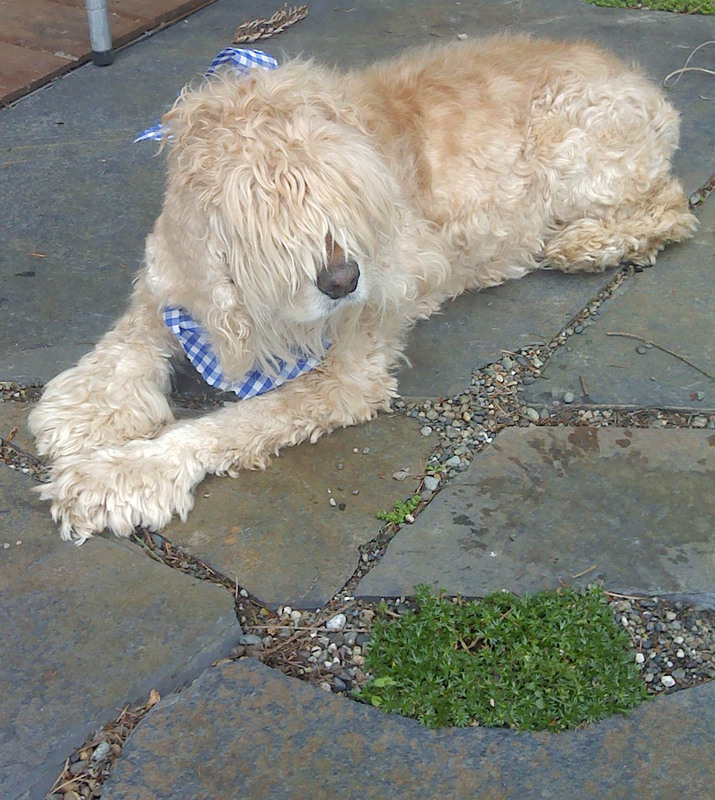 My grandson Rain helped me plant my flagstone patio. I stepped away and his friend came running in and said “I keep telling him they’re stepables not stompables.” I looked up to see my grandson stomping on the freshly planted ground covers. Surprisingly, the plants survived just fine. I want a plant that doesn’t grow over the flagstone too quickly. 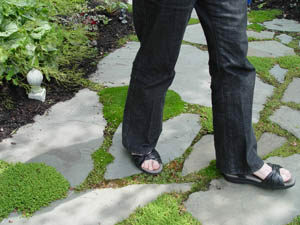 If you plant a type of stepable that grows too vigorously you will be constantly cutting the plant off of the flagstone. Untended it will completely cover your flagstone. A slower plant might need a trim every year or two. 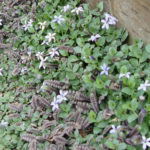 What do stepable groundcovers need? 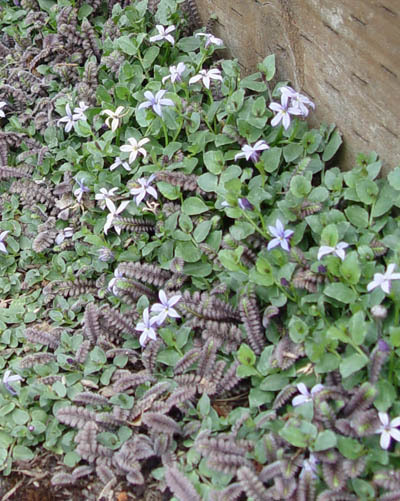 Most stepable plants require good drainage in order to grow thickly and repel weeds. If they don’t grow thickly, and have bare patches, weed seeds will be able to reach the soil, germinate and thrive. I’ve listed plants below for part sun and full sun. I don’t have a stepable plant that thrives in strong shade, regardless of what the plant labels say. I’ve tried several that manage to stay alive in dappled shade but don’t grow thick enough to repel weeds. Another tip: Don’t plant in an area that was infested with weeds. You will need to tackle the weeds first before you plant your stepables. Here’s a close up of ‘Platt’s Black’ Brass Buttons with Star Creeper. Leptinella squalida – New Zealand Brass Buttons. The variety I prefer is ‘Platt’s Black’. The other variety of Brass Buttons I like, ‘LePrinella P. Verdigris’ is a a little fast for pavers but I have used it for paths. I don’t grow either of these in full sun. They spread until they find an environment they don’t like. In my patio they run into too much shade and the strong roots of sword fern and they stop there. These are spreaders so think before planting. Mentha requienii – Corsican Mint This is a crowd pleaser because it smells good when you step on the plant. This plant needs some sun, and needs good drainage, too much shade and soil that is too wet in the winter will kill this plant. Full day sun is too much for this plant. 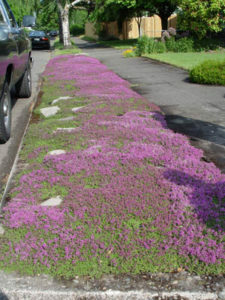 Thymus Serpyllum ‘Elfin’ or ‘Elfin Pink’ – I love this plant and it is truly a flat mat if you step on it regularly. It does get weeds growing into the middle so it’s not maintenance free, but only garden magazines talk about maintenance free landscapes. When it is successful you will have to cut it off of flagstones some but I find it quite manageable. Stachys Densiflora ‘Alba’ – Alba Lambs Ear First of all this plant looks nothing like the traditional cottage garden plant (silver furry leafed) Lambs ear. The tiny leaves are fully evergreen, dark green and leathery. I love this plant because it doesn’t let weed seeds in. Plant it on the edges of your path unless you plan to step on it every day, otherwise it will mound up. It takes full sun easily and the flowering period is fantastic! The seed heads are interesting as well. Azorella Trifurcata ‘Nana’ – Cushion Bolax I have this plant at my vacation house in full morning sun (so 4 hours) and it will take full day sun as well. It occasionally has a dandelion sprout in the middle, but other pesky weeds don’t invade. I find it to be very low maintenance and perfect for a place I only visit every month or two. 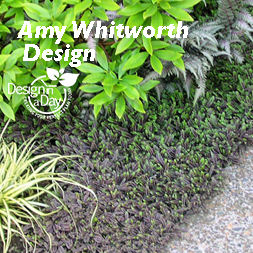 It will creep over your pavers so plan to trim once every year or two. It’s my favorite filler plant for pavers, paths and as a foreground plant in a planting bed. 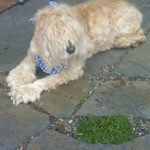 My dog Barley looking at freshly planted Cushion Bolax. I love the texture. It goes through a change where the little needles feel like a plastic carpet (which sounds bad but is fun) and then it softens into a pettable surface. The yellow flowers are tiny fat buttons and cute.